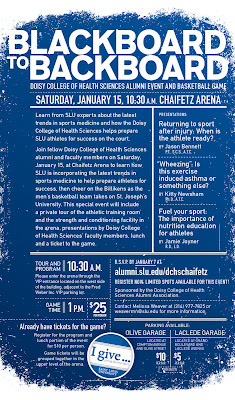 The Doisy College of Health Sciences Alumni Association invites Doisy College of Health Sciences alumni to an event on Saturday, January 15, at Chaifetz Arena for a look at how SLU is incorporates the latest trends in sports medicine to help prepare athletes for success, and then cheer on the Billikens as the men's basketball team takes on St. Joseph's University. 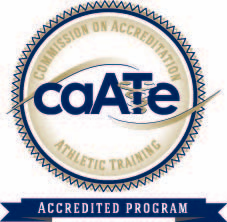 This special event will include a private tour of the athletic training room and the strength and conditioning facility in the Arena, presentations by Doisy College of Health Sciences' faculty members, lunch, and a ticket to the game. Returning to sport after injury: When is the athlete ready? "Wheezing": Is this exercise induced asthma or something else? Fuel your sport: The importance of nutrition education for athletes. Tour and program begin at 10:30 a.m. Game begins at 1:00 p.m. Cost $25 per person R.S.V.P. by January 7. Register now. Limited spots are available for this event! Already have tickets for the game? Register for the program and lunch portion of the event for $10 per person. 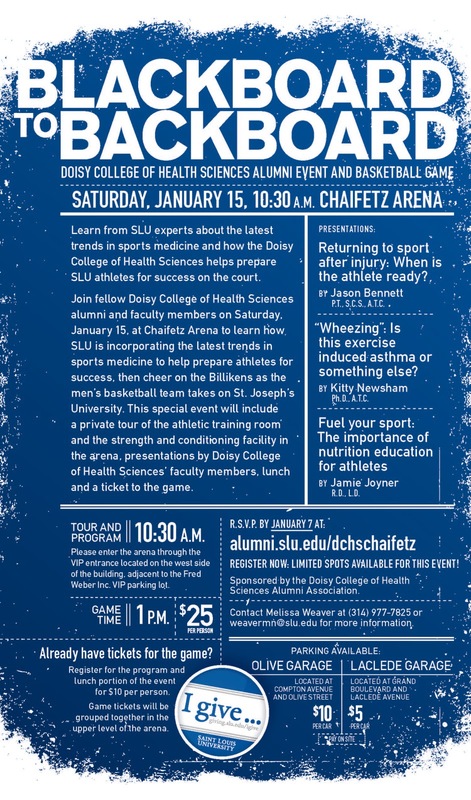 Sponsored by the Doisy College of Health Sciences Alumni Association. Happy Holidays from SLU Athletic Training! Billiken Hockey Having a Great Year!